Classes. Tutorials. One-on-one research. We've got it. Novo Collegians enjoy a wide assortment of opportunities for engaging with faculty and their fellow students. From traditional classes and labs to group tutorials and small seminars to one-on-one research arranged with faculty for thesis work, at New College you have a chance to explore in-depth the areas of learning that are of greatest interest to you. Choose the term you wish to search and click the “Submit” button. From here you can choose search criteria on the “Class Schedule Search” page to query courses according to your needs. 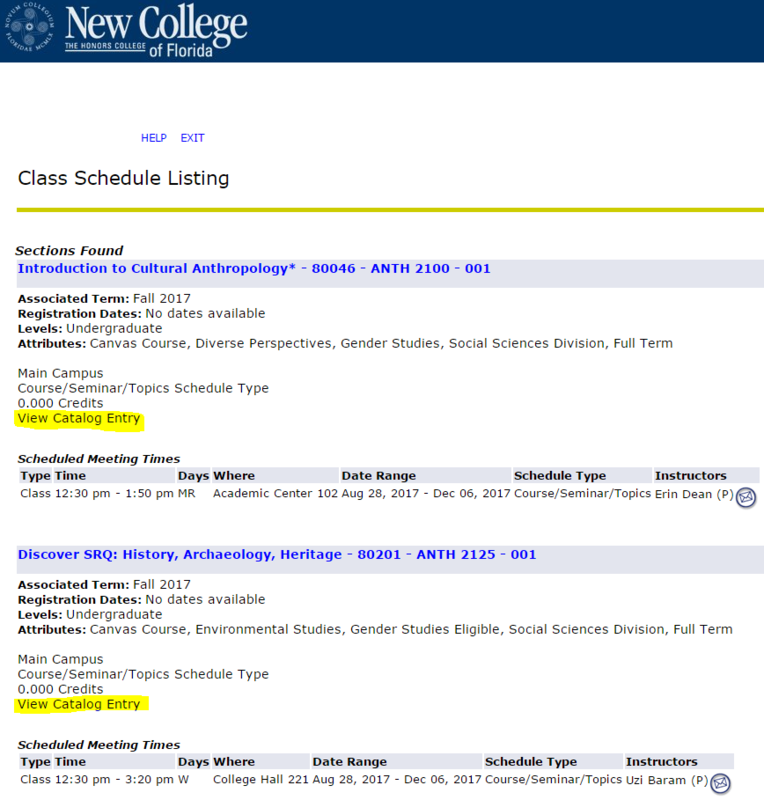 How to search the online course schedule. Subject: Select “All” to search the full class schedule or select individual disciplines to view their course offerings. Schedule Type: Can be used to separate general topics/seminar courses from laboratory and thesis-related courses. Part of Term: Can be used to filter courses based on when the course takes place within the semester. You may also filter by full term – mod credit equivalent courses that run the full length of the semester but only carry 0.5 unit. You can also see the set of dates during which a course takes place by looking at the “Date Range” listed at the bottom of the course listing. Attribute Type: Think of an attribute as an identification tag on a course. Can be used to search for classes that fulfill LAC requirements, for example. For more information see Attribute Types. Start Time, End Time, and Days: Select days of the week and/or start and end times to find classes that fit your schedule needs. Please see the Uniform Class Schedule for specific class meeting time blocks. After you have selected your search criteria, click the “Class Search” button at the bottom of the page. To access and view the course description and other details about each course section, click the “View Catalog Entry” at the end of each course listed. Each entry will include information about the meeting times, course attributes, instructor, and classroom assignment (see note). Please note that when asked to include the Course Request Numbers on your contract you will still provide the 5-digit number to the left of the course subject code. For example, the Neurobiology course listed above has a course request number (CRN) of 80008. To return to the “Class Schedule Search” page, click the “Return to Previous” link at the bottom of the “Class Schedule Listing” page or click the Back arrow on your browser. You can clear the previous search by clicking the “Reset” button on the bottom of the “Class Schedule Search” page and select new search criteria. Note: Some classroom assignments appear as TBA until they are finalized. All classroom assignments are subject to change before the start of a term. Please check the Class Schedule Search page regularly for the most up-to-date information. For course descriptions from past semesters, please contact the Office of the Registrar.